Mild mannered, talented and infinitely witty, Tim Hatcher is one those folks who stands calmly like a touchstone when the world gets hectic. Anyone can tell you, just a few words of conversation with him, amidst deadline stresses and last minute mayhem, and even a Tasmanian Devil will feel that much calmer. Yet, I knew behind his pleasant demeanor, those twinkling eyes held some secret passion, but for what? The ukulele! And what a wonderful muse it is! With great pleasure, I discuss the wonders of that nineteenth century Hawaiian rajao, with animator and ukulelist, Tim Hatcher. KARA: So Tim, why the ukulele? TIM HATCHER: Back in 2005 when you and I were still at DNA Productions, you may remember that David Tart (animation director) put together a little chamber orchestra with three animators. He invited me to join them as well, playing the viola, which I had played as a kid. I declined since it had been more than two decades since I’d picked up that instrument. But I was entranced with the idea of playing an instrument again, and so on my own I started renting a viola and taking lessons again. I had no delusions about joining the DNA chamber orchestra, but that musical impulse had been triggered. So after a year of part-time study on the viola I concluded that it wasn’t a good match for me. It was too difficult and frankly not very fun. I never reached the point of making music that even sounded good, so the rewards were few. At some point after I returned the viola to the music store, the idea of buying a ukulele came to me somehow. So I got on the internet and browsed websites and ended up buying a soprano “Flea” from fleamarketmusic.com. It cost about $149. At the time, I knew no one who played the uke and had no idea that a 21st century ukulele renaissance was in its early stages. KARA: Do you remember the first time you heard a ukulele or when it first made an impression on you? 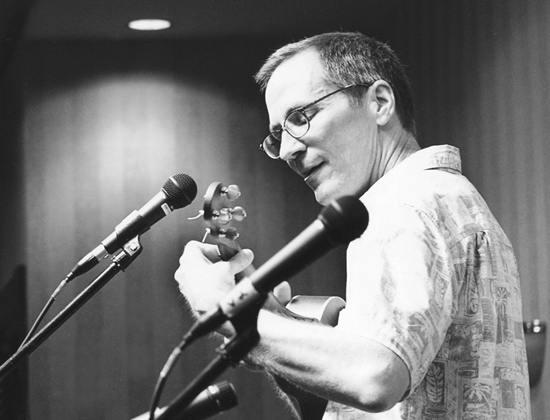 TIM HATCHER: I have no memory of a specific “aha” moment with the ukulele. When I was a kid in the sixties, Tiny Tim came along with his hit song and severely crippled the uke’s image for decades. To this day, uke players are still struggling to overcome the uke’s damaged reputation caused by “Tiptoe Through the Tulips”. His success was a bit of a mixed blessing because it did raise awareness of the uke, but it also sidelined it as a novelty or a toy. It’s still surprising to many people that a uke can be the source of beautiful music. It all depends on the hands that hold it. By the way, although I spell it as “ukulele”, it’s acceptable but less common to see it spelled as “ukelele”. You’ll hear some people pronounce it “oo-koo-lay-lay”, which is a nod to its Hawaiian origins, but to my ear that sounds pretentious unless you happen to be Hawaiian. But it’s just a matter of personal choice, of course. One of the first rules you learn in ukulele society is that there are no rules. KARA: What does playing the ukulele give you that other art forms like animation and writing have not? TIM HATCHER: Animation and writing are not performance art so there is no instant gratification as with music. The downside is that it’s more nerve-wracking. Then there’s the thrill that making music brings….the effect of music on the soul. It can be very, very relaxing….but only when I’m playing it alone for my own enjoyment. When I’m playing in front of an audience it can be quite the opposite. KARA: Your ukulele was delivered at a pivotal moment in your life. What were your thoughts as you took it out of its case? TIM HATCHER: As it happens, my first uke arrived on my first day of unemployment after being laid off from DNA. Even then I had a sense that this was a perfect choice for me, and that it would not be just a temporary diversion. That was May 8, 2006. KARA: We know you are also an accomplished playwright but you’ve said that part of your life is on the back-burner for now. Why this decision? Do you miss it? TIM HATCHER: It’s an overstatement to say I’m “accomplished” as a playwright. Yes, I’ve had many productions and I did get a MFA in playwriting from Yale, but I have never had a breakthrough that allowed my writing to become my sole means of earning a living. I was able to supplement my income with it for a number of years, but I was never what you’d call prolific. And after leaving grad school, I had student loans to pay back and that made it easy to return to animation for an income. And once DNA started growing and doing exciting things, it became very appealing to stay there and see where the ride would take me. I’m very glad I did, because now I have a respectable career doing something creative that I find fulfilling. The fact that it isn’t writing does not bother me. I had grown to be somewhat weary of the production process in theater, because one usually feels he or she is compromising again and again, so the sense of artistic fulfillment does not come along often. Or at least that was my experience. KARA: I saw your credits in the very fun game Cold War: Clambake that was available as an app on Facebook. What are some of the things you contributed to the game. It is very entertaining! TIM HATCHER: I’m glad you enjoyed it! I was one of several people hired to provide creative content for the game. That included the creation of characters, situations and spy-mission scenarios with a comedic slant. It was fun to create characters and then later see illustrations of them. On the other hand, though, to someone who is used to a traditional narrative form, the multiplicity of story threads was a little overwhelming at times. There was always the sense that there were no boundaries with regard to time. The story never ends, in a way. KARA: About the ukulele, it has such an interesting sound. I often thought of it as a happy instrument. Memories of Tiny Tim and “Tip Toe Through the Tulips” come to mind. But some of the songs are melancholy. Do you think the sad song with the high-pitched strings are in opposite or enhance each other? TIM HATCHER: To me, the primary reason that a uke may not be ideal for slower songs is that it has a relatively low sustain when compared to other stringed instruments. That is, once the strings are set to vibrate, the sound fades quickly. In slower songs, there is more space between the notes and therefore a greater potential for silence on the uke. With a guitar, the reverberation of the strings easily carries the listener from note to note, or chord to chord. But I do think sad songs can work just fine on a uke. The form and quality of the expression is largely determined by the person playing the instrument. The only limitations are in the imagination or abilities of the musician. KARA: What song have you picked that, once played, really gripped your heart? What were you thinking about when you played that number? TIM HATCHER: That’s a great question. I’ve been surprised at how I have gained new appreciation for songs I may have known all my life, but only really got to know well once I learned them for the ukulele. For example, one of the first that I learned was “All I Do is Dream of You”. It was written in 1934 and most people know it from “Singing in the Rain”. In that film it is performed up-tempo, which I think deprives it of sentimentality. In researching the song (as I usually do when I want to perform a song), I found that it was written for a Joan Crawford movie, “Sadie McKee”. In that film it is performed softly, at a medium tempo (on a ukulele), and is very sweet and romantic. That’s the approach I take with it. The very concept of letting a song “grip your heart”….I think that’s what performing a song is all about. You are truly telling a story when you sing a song, and in a sense you are asked to make the song your own, to convey it as if it’s YOUR experience. Usually this is done in subtle ways, of course, but if a song doesn’t “grip your heart”, then maybe it’s not the song you should be singing, if we’re talking about solo performance. KARA: I’ve noticed there is a simple innocence in the combination of voice, ukulele and old song. Is that part of its charm for you or something else? TIM HATCHER: That’s definitely part of the appeal. Yet I can see that when it’s just a single instrument and a voice, there is definitely a burden on the performer to make it interesting. A singer backed by a band or orchestra has less chance of boring an audience, I suspect, because of the power in all of that sound. But there is power in keeping it simple and intimate, too. I enjoy the challenge of tailoring a song and a performance to the smaller scope of a uke, rather than just trying to mimic whatever arrangement your most familiar with. For example, one can sing “Hey, Soul Sister” on a uke with no other musicians, but you have to remember that there is no band filling in the background for the listener. You’re a solitary voice and you could sound silly trying to sing it as if you’re a rock star. But everyone has to find out what works for him or her. KARA: If you could take one song with you on a long journey, what would it be and why? TIM HATCHER: If I were limited to one song, it would be an obscure song from the forties called “Just a Prayer Away”, and I can’t mention that song without the backstory. 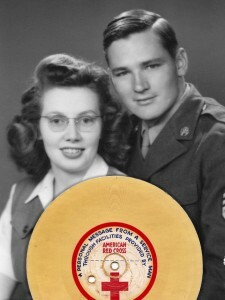 In World War II, my mother and father met while they were in the service. For a time, my father was stationed in Guam, and my mother was back in the states, but became ill and was confined to a military hospital for over a year. One day the Red Cross visited each patient’s bed and invited them to record a message on a little cardboard record that would be sent by mail to a loved one. My mother sang this song for my dad, a cappella, signing off with the words, “Bye for now, Bill”. They married after the war ended, and when I was a kid I would play that record and sing along. I still have it, in fact. (“There’s a happy land somewhere, and it’s just a prayer away. All my dreams and plans are there, and it’s just a prayer away. Where the stars look down on a friendly town filled with laughing children at play. KARA: Nice! I like that so much! Who is your favorite composer to perform and why? Which is your favorite to just play in the quiet of your home? TIM HATCHER: I’m a big fan of songwriters from the early 20th century, such as Cole Porter, Hoagy Carmichael, Harry Warren, Irving Berlin, Walter Donaldson and Gus Kahn. Porter is probably my favorite because his lyrics are often a wonderful mix of humor, sophistication and cleverness.. On top of that, his melodies are sophisticated, interesting, and very singable. KARA: After a long day of work what do you look forward to when you pick up a piece by these composers just mentioned? KARA: On your website “Vo-do-de-o Days” you have some really nice videos of various performances, from the comfortable setting of your home and also a black-tie event. They are all great but I especially like the tux-attired performance because your interaction with the audience was really special. Why did you choose that particular piece and why did you want to share it with them? TIM HATCHER: It was largely a question of timing. I had to choose from the few songs I felt I could whip into shape by the time of the event. I’d been practicing that number, “South of the Border”, for a long time, so it was an easy choice. I did a second song that night which didn’t turn out as well. It was Joni Mitchell’s “Free Man in Paris”. It works well on a uke, but I stumbled a few times during the performance which is always a big disappointment. By that I mean I stumbled on the lyrics once or twice, which throws off the rhythm, of course. KARA: When do you let go of the technical and let the music flow? Does the extra research help you get into the song? See where its coming from, the composer’s motivation? TIM HATCHER: That moment of letting go has to happen on its own. I always want to let go of the technical, but it’s not something I can plan. I have found that once I get the technical elements down pat, it will take flight sooner or later and I can “ride” it. It’s rather like the uke is your surfboard and the song is the wave. You hope to eventually hit a wave just right and find yourself being carried along by it. Or maybe it’s like breaking a horse. One day you just realize it’s doing what you have wanted it to do for so long. KARA: Your website has a very interesting name , “Vo-do-de-o Days”. Where does the name come from? KARA: Your website also has a lot of information about the numbers you perform. I think you enjoy doing the research as much as or almost as much as playing the pieces. Am I right? TIM HATCHER: Yes, you are. I get a kick out of learning more about the songs I like and in doing so discovering more about the composers and the story of their lives. It’s fascinating to me that a person can create a song and leave it behind when they die, and that song can go on to entertain us, in small numbers or large, for a moment or for a lifetime. KARA: There is an incredible ukulele community, right? How did you discover them? Was it a surprise? TIM HATCHER: The global ukulele community has been growing steadily for a few years now, thankfully, but when I first decided to pick up a uke and learn it, I had no awareness of that community at all. After I started playing I began searching the web for resources and found one website after another devoted to ukes and uke players. When I got involved with the local group, the Dallas Ukulele Headquarters, there were only about a dozen active members even though the group had been around for about ten years. Now, though, the group’s website has 464 registered there. (www.meetup.com/ukulele-84) And this year was the third year of the Lone Star Ukulele Festival, held in Dallas in April. It was orchestrated by a few of the members of the Dallas Ukulele Headquarters, Noel Tardy and Mark and Kathy Levine. KARA: Tell us a little about the group. What is the most interesting thing you have learned from someone in the group? TIM HATCHER: The group is comprised of the full spectrum of players: beginner to advanced, liberal to conservative, young and old. Some are singers and some are not. Some crave the spotlight and others wouldn’t dream of stepping up to a microphone. But we are united by a love of this little instrument and an itch to meet up with other uke players and have some fun. The most interesting thing I’ve learned–well, that’s an open-ended question. I’m always picking up one thing or another from the other members, but I am learning the most from just watching myself over the years, as I continue to study and practice and perform and see how I respond, and grow and change. The most amazing thing I’ve learned about myself is that I absolutely hate to perform in front of an audience, and I sort of love it, too. KARA: Learned any Cole Porter yet? <grin> Pretty please? TIM HATCHER: I set out to memorize a Cole Porter number just for you but my focus was pulled onto another song I’d been trying to learn for about a year, “The Girl in the Little Green Hat”. I found myself entering the home stretch on that one so I felt the need to give it my all. But I’ll get to a Cole Porter song SOON. KARA: No complaints. I love “The Girl in the Little Green Hat” and I’m very happy to post it here! Cool! Is there anything else you would like us to know about your artist’s journey? Something you have learned along the way? TIM HATCHER: The most valuable lesson I have learned in my journey with the ukulele, which is true on almost any artistic path, is that there is great joy and value to be found in sharing your art or your music with one person here and there, or a tiny audience in a living room, regardless of whether you ever share it on a huge scale to great critical and financial success. Or just doing your thing all alone, watching yourself grow as a musician or an artist, even if you are the only observer–it all has value. And along with that comes the understanding that once your art becomes the primary source of your income, then it has become a job to which you have become a servant. When a labor of love becomes a labor of necessity, the fun can get sucked out of it. KARA: Thank you so much, Tim, for stopping by and sharing your experience of finding your muse within a most wonderful musical endeavor. I cannot wait for the next installment on your blog. 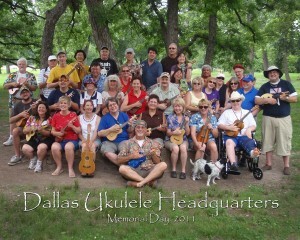 For more information, check out Tim’s blog, http://vo-do-de-o.blogspot.com the Dallas Ukulele Headquarters and the Lone Star Ukulele Festival. Thanks again, Tim, this was truly a pleasure! To my readers, please feel free to post a comment or question. There may be a delay as I sift through the daily spa-m I get but I will post yours as soon as possible. I appreciate you! So great to hear more about the wonderful Mr. Hatcher. I REALLY want to learn the uke because of all the fun he has had with it the last few years. The story about the recorded song from his mom to dad is precious.